Some of you may have heard of or even seen the Thai film, Ong-Bak: Muay Thai Warrior (called Ong-Bak: The Thai Warrior in America). This movie set the foreign film world on fire with its awe-inspiring martial arts and action choreography. The Director, Prachya Pinkaew, afterwards directed this 2008 film called Chocolate (or Fury), basically the same kind of movie but with a female lead. You don’t hear any complaints from me. We start the story where, in my opinion, all good movies should start; with people pointing guns at each other. We are invited to a “negotiation” between Thai gangsters and the Yakuza. Misashi, the Yakuza representative in the room, solves this problem by trying setting up an agreement with rival gangster No. 8 (he is never named in the movie). The edge of the knife they all play on almost tips, but Misashi succeeds and no one dies. Before leaving he spots Zin, girlfriend of No. 8, and falls madly in love. The two live happily until No. 8 forces them apart through threats, sending Misashi back to Japan, and stopping all communication between the two. Zin, realizing that she is pregnant, moves into an apartment complex and raises her child. Her daughter, our hero Zen, is born Autistic (further viewing revealed more towards Mental Retardation). When No. 8 returns, they are forced to relocate to a Muay Thai school. Born with amazing natural reflexes, Zen learns martial arts by applying what she learns by mimicking movies and the Muay Tai school students who live near her. Many years pass and Zin is diagnosed with Cancer. Not having enough money to pay her doctor’s fees, Moom, a child Zin adopted years before, and Zen work together to raise the money by having Zen perform feats of dexterity. After performances fail to pay the bills, Moom discovers a book with records of all the people who use to owe Zin money, back when she was a No 8’s girlfriend. With this in mind, the two ask to get the money back, but unfortunately Zen is going to have to find another way. Perhaps these individuals will be convinced with her feet; usually in their face. Yanin “Jeeja” Vismistananda plays our autistic hero Zen, having trained a total of four years in multiple martial arts for her first theatrical role, even doing all of her own stunts. Hiroshi Abe (whom I recognized from just re-watching Happily Ever After) plays the imperfection obsessed Yakuza Misashi. Thai super-star triple threat (he’s an actor, singer, and director). Pongpat Wachirabunjong plays the villain gangster boss No. 8. Ammara Siripong plays the street smart Zen and Taphon Phopwandee plays the makeshift care-taker Moom. 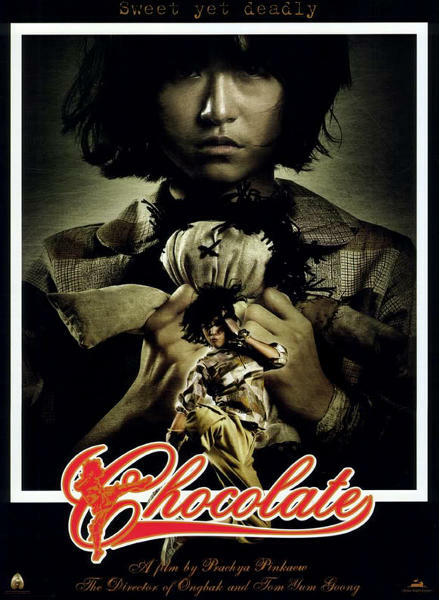 After watching Chocolate, I realized that something was missing from my life; that something being the choreography talents of Panna Rittikrai (Ong-Bak: Muay Thai Warrior and Tom-Yum-Goong). He creates fight scenes that I wish American counterparts could hold up against; creative and complex, but easy to follow. 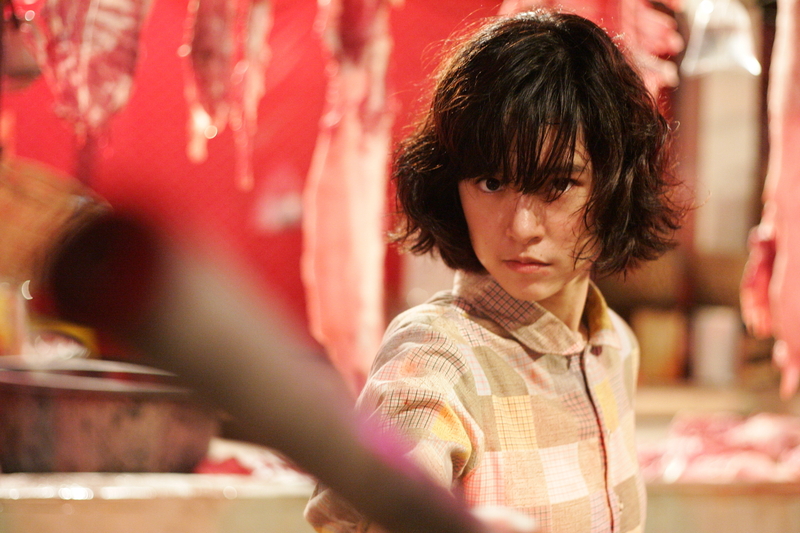 I said earlier that Jeeja did all of her own stunts, and it shows in spades; each fight scene is a separate entity in my head, with Jeeja focusing on utilizing the different elements of the surrounding area (all Jackie Chan style). Realism is another facet in Rittikrai’s bag of tricks; there is a scene in the movie where a goon throws a butcher’s knife at Zen, he misses and the blade ricochets off the chain fence behind her, nailing him in the chest. This is all done in one shoot. I almost thought that they really killed him on set. If this doesn’t convince you, then look at the pictures of Jeeja that I have in this review. They show her with the scraps and cuts she obtained while recording. Rittikrai plays it real. This movie goes the extra mile with its lighting. Zen’s home is bathed in emerald-green, giving a homey feel that invites you back each time the film returns there. The lighting in the fight scenes is where the movie really takes it up a notch; to the point that I can tell you the name of the fight scene by the main color palette: a deep blue ice block factory, a cloudy brown cargo warehouse, and most beautiful of all, a crimson red slaughter-house. What is also great about these settings stems from how they were able to showcase Thailand’s beauty and economic growth. There is even a two-minute animated bit that tells of a dream that Zen has, which is brimming with orange tones that go beautifully with her green eyes. Pros: Some of the most beautiful fight scenes ever filmed. Jeeja’s autistic role in the film was eerily convincing; there are scenes in this movie where she is interacting with people which downright unsettled me. I am not sure that anyone else could have pulled that off. The cast brings it all the way home, being likable, convincing, and enjoyable to watch. Cons: Either the subtitles or the movie itself has a problem telling you things that you need to know, like the names of characters. For instance, I needed to look up what the villain’s and his cross-dressing assistant’s names were, because the film itself doesn’t state them. Maybe this is just Magnet messing up their subtitles again (a familiarity I have with their Let The Right One In release). Some people might just not be able to work with Zen as a character because of the realism of her autism. Chocolate took my expectations and back-flipped them straight into the air; a fun sight to behold that takes its gangster plot and really runs with it. Magnolia Pictures released this film and my Netflix copy screams at me to buy my own copy. In the future, it just may wind up in my collection. Chocolate is by far one of the most breathtaking martial arts films that I have ever had the pleasure of seeing.